Choosing a ring that will adorn your hand for the rest of your days is a daunting task for anybody, especially for a guy who doesn’t understand the first thing about jewellery. Although many women dream about their perfect dress or the ultimate cake, for me it’s always been about the ring; for a long time (before I even met Josh) I’ve known exactly the kind of thing I wanted, which was cemented a few years ago when I took a trip to Amsterdam’s Diamond Museum with a girlfriend. 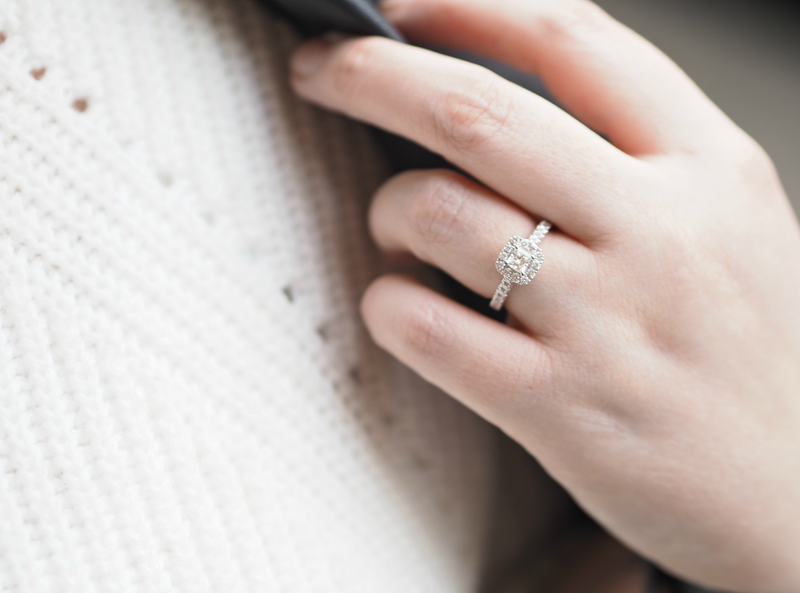 As we were the only two in the store the shop assistant insisted that we both try on everything in sight; my preference has always been a princess cut halo diamond, and that was undoubtedly the style that seemed to suit my hand best. I’m a firm believer in fate (cemented by the way we met, which you can read about if you’re interested here,) and my ring and I were meant to be. It was the last ring I tried on in the last shop – and I wasn’t even intending to go in, but thought I’d tick it off just to make sure I’d covered all bases. 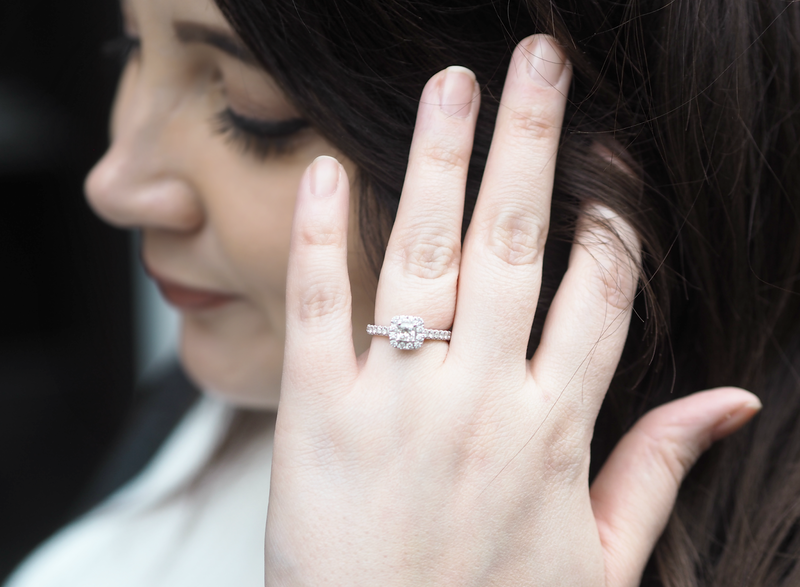 It wasn’t even one I’d chosen myself, but it recommended by the sales assistant who popped it on my finger to try; it was the perfect style, the perfect fit, the perfect size, the perfect sparkle and even had 20% off as a special promotion. Instantly I got goosepimples and knew it was the one (and Josh was just pretty happy he’d be saving 20%.) That was it! 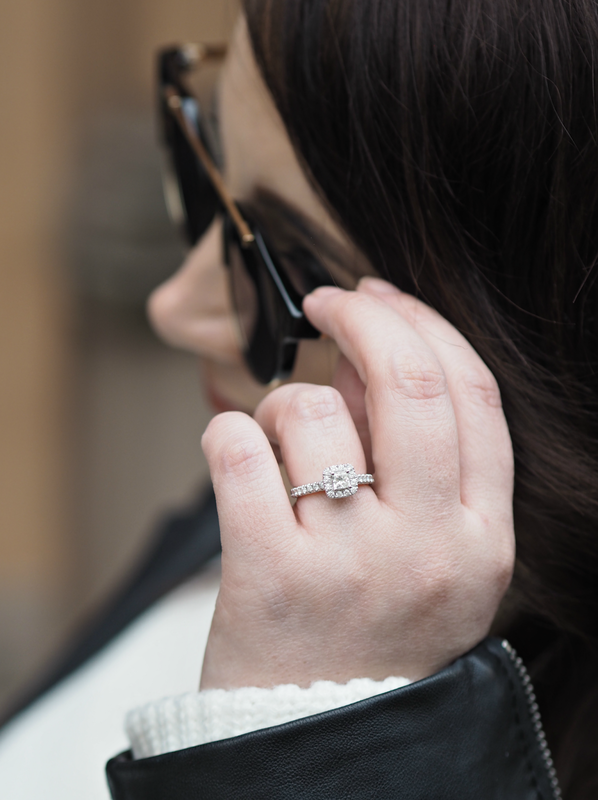 A few months after we chose the ring (and Josh secretly bought it) came the exciting part… Our first ‘proper’ date was on the London Eye, where we watched the sun set over the landscape and took in the incredible views. On the evening we got engaged, Josh had booked a restaurant that overlooked the Thames and the Eye (a special significance that I didn’t realise until later.) There’s no major story here and I don’t want to go into the super personal details, but suffice to say we had a lovely evening – but the ring was yet to make an appearance. It wasn’t until we got home that I knew something was up when Josh started to be soppier and more reflective than usual, eventually blindfolding me so he could get the gigantic ring box from out of his hiding place. In reference to our favourite film, ‘Back To The Future’ Josh nervously asked me if I’d be his ‘partner in time’ while I (think) I grinned from ear to ear. After he finally got down on his knees to ask the question properly, I realised the size of the box was so gigantic that there was no way he could’ve hidden that in his jeans or coat pocket (a major flaw Mr Jeweller!) I’d always had the perception that rings come in little tiny boxes that can easily be concealed, but this one was so big it was about as subtle as a box of cereal. Hearing the words ‘will you marry me’ is such an odd and emotional experience and I reacted by bursting into tears and flinging my arms around Josh; he reacted by not even knowing which finger he should be putting it on! Men. So here we are. We’re looking forward to the next few months as we plan our Big Day and enjoy all the trappings that come with it. We’ve got a date, a venue and a plan of action (as well as a tonne of Pinterest boards) so I’m going to thoroughly immerse myself in the process and enjoy every moment. The last couple of weeks have been spent googling, pinning and mentally scrapbooking and I think we both now know exactly what we want; being on the same page and having the same expectations certainly makes things easier, as there are no big decisions to make. Over the next six months or so I’ll undoubtedly be sharing snippets and advice I learn, as well as bits and bobs after the big event; I want to be able to document the whole experience for not only ourselves, but for our future generations too. Apparently it's a common thing! My cousin did the same thing when he proposed! Congratulations on your engagement, it sounds like a lovely proposal, I'm sure you will have lots of fun planning your wedding day. Haha there will be a lot of BTTF references on the day too I'm sure! Congrats!! It's always interesting to hear engagement stories from other couples!